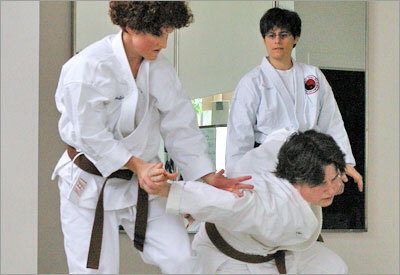 Testing always provides me with a personal mental and emotional forum to assess my martial arts training to date. For me the act of testing, of demonstrating my proficiency in cumulative techniques, principles, and philosophy, is the punctuation of my training experience. It gives me the opportunity to reflect on my progress along the way, and to acknowledge strengths and weaknesses, and areas for self-improvement. I’ve been training in Cuong Nhu for almost eight years. Martial arts is my main form of exercise, stress release, and the ticket to a good night’s sleep, it is also one of the few things in life that gives me a deep sense of fulfillment and happiness. The pleasures and benefits of training are not just physical in nature. Training provides me the opportunity for self-reflection, self-awareness, and self-realization. It connects the physical and spiritual and allows me to develop and grow as an individual.What I’ve come to realize over the years is that I make me a better person by training by being aware of my self, my motivations, of recognizing and overcoming mental and physical challenges, and being open to learning from myself and those around me. When I first started training in Cuong Nhu several years ago my goals were to learn self-defense, get in shape, and “improve myself”. At the time, my impression of training in the martial arts was that there was some sort of special thing that made you a better person. One of the special things about Cuong Nhu is the philosophy. It gives meaning and depth to martial arts training. If training were merely physical in nature is would be just sport. Similarly, philosophy requirements are not just words we are required to memorize and spew back out on a test. The philosophical concepts that we are required to learn at each level of training help to make martial arts practice a whole experience. Realizing these concepts and putting them into practice connects the mind, body, and spirit. The connections and realizations that I make reflecting on my training spill over into other areas of my life, positively affecting how I respond in difficult situations and how I react and relate to other people. Because this paper must be brief I’d like to share just some of the Cuong Nhu philosophy that has been meaningful to me since I started training and in particular while preparing for my black belt test. I learned open heart, open mind, open arms my first week of training. These ideas are simple but so important. I realized early on that if you want to get the most out of training, and life in general, you have to check ego at the door and approach learning with an “empty cup” attitude, which means being completely open to ideas, suggestions, feedback. Only by being open and honest about my training have I been able to learn from my teachers, classmates, and myself. Having an open heart and open arms creates an atmosphere of acceptance, harmony, and love- ideal conditions in which to learn and grow. I think that most of us Cuong Nhu practitioners embrace these concepts- this is why training at my dojo, Tuyet Tan (Moon Dragon Dojo), and attending Cuong Nhu camp is so special. The 3 O’s are definitely the food that we must feed our souls in order to thrive in the martial arts and life. Another basic set of philosophy concepts that I treasure is the “5 A’s for Self-Defense”. They are like tools that I carry in my pocket wherever I go. I travel for work and have found myself in different cities all over the United States: strange cars, highways, neighborhoods, parking garages, hotels, etc. No matter what time I arrive in an unfamiliar destination, my mind and body snap to attention as soon as I leave the crowd. Awareness. Am I wearing comfortable enough clothing and shoes to run in if I have to? Will I have to walk through a semi-lit parking garage to get to the rental car place? Am I being followed? During one business trip I decided to walk to a restaurant that I’d been to previously. I had an idea where the restaurant was but I was on foot whereas the time before a friend picked me up and we’d gone by car. I ended up walking through a very quiet part of the downtown area and was a little lost. I recall being surprised and a little unnerved because during the day this area was bustling. It was still light out and I felt relatively safe but I had this very heightened sense of awareness, picking up visual and aural information from block to block until I got to the restaurant. Nothing happened but I felt as if I had escaped something. It was a creepy experience, which I’ve been more careful to avoid during subsequent travels. I still enjoy experiencing new cities by foot; however, now I inquire about the safest routes with staff or obtain a map prior to venturing from the hotel for a long walk in an unfamiliar neighborhood. Alertness prepares me for the things that I haven’t thought of such as someone suddenly striding up behind me. A couple of weeks ago, as I was leaving the dojo a man strode up quickly behind me. I was carrying a small folded umbrella and was thinking “if he grabs me from the side or behind I can do a right sided back stance and thrust the blunt end of my umbrella right into his mid-section like that move from tambo 3”. This scenario went calmly through my head in about two seconds. Thankfully there was no need for any of this and the guy just kept moving quickly right past me. It was reassuring that my body and mind were in sync anticipating having to act. Self-defense is multi-faceted. The 5 A’s, which represent both physical and mental activities are not about being paranoid but about being smart about your immediate surroundings and about using your mind and your sensory tools. I don’t go anywhere without them. I would not be writing this paper today without the big “D’s”. Direction. I’ve gone through periods of passivity in my training and have come to conclusion that you get nowhere fast with out having goals, or direction. The means towards the goal is the just as important as defining where you want to take your training. By making the commitment to training for this next rank I had to mentally and practically pave the way for success: making sure that I’m able to come to class regularly, that I cross-train, maintain a healthy lifestyle (a.k.a. fortifying my body), and learn and drill the material for which I’m responsible. This has required stores of discipline that I didn’t know I had. Because of having to re-visit techniques that I don’t count among my strongest having a non-defeatest attitude is essential to keep me positively focused on my goal and to not getting hung up along the way by negative thinking. So my discipline is mental as well as physical. Dedication. Training in the martial arts and particularly Cuong Nhu is special. By devoting myself to training in this art and working my way through the ranks I dedicate myself to a physically and spiritually noble purpose by always trying to improve myself and my abilities and setting a good example to those around me. Determination means that I stay firm and resolute in the desire to meet my short and long term goals. Do until death speaks for itself. As stated in the 2nd Code of Ethics: “To develop the people into morally, physically, spiritually strong individuals takes one hundred years”. My long-term goals are to stay committed to the Way- growing, learning, and sharing. In reflecting on my own experience with these concepts the thing that is most dear to me is observing these ideals demonstrated by my selfless and generous teachers and classmates. There is great synergy played out by our mutual dedication and commitment to teaching, learning, and love of Cuong Nhu, which only underscores how special our art is. I chose to write about Cuong Nhu philosophy because it comprises important concepts that give our style substance and depth. For me, having to internalize and actualize these ideas over the years has made my training more profound and helped bridge the gap between training only being in the dojo to training positively affecting other areas of my life, personal and professional, and for this I am confident that I am a better person.